It is an URI for accessing files via the WebHDFS file system. Note that WebHDFS uses the HTTP port of the namenode but not the RPC port. In the configuration of each cluster, the default file system is set to the mount table for that cluster as shown below (compare it with the configuration in Single Namenode Clusters). The authority following the viewfs:// scheme in the URI is the mount table name. 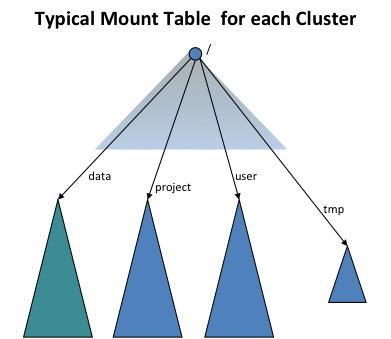 It is recommended that the mount table of a cluster should be named by the cluster name. Then Hadoop system will look for a mount table with the name “clusterX” in the Hadoop configuration files. Operations arrange all gateways and service machines to contain the mount tables for ALL clusters such that, for each cluster, the default file system is set to the ViewFs mount table for that cluster as described above. The mount points of a mount table are specified in the standard Hadoop configuration files. All the mount table config entries for viewfs are prefixed by fs.viewfs.mounttable.. The mount points that are linking other filesystems are specified using link tags. The recommendation is to have mount points name same as in the linked filesystem target locations. For all namespaces that are not configured in the mount table, we can have them fallback to a default filesystem via linkFallback. In the below mount table configuration, namespace /data is linked to the filesystem hdfs://nn1-clusterx.example.com:8020/data, /project is linked to the filesystem hdfs://nn2-clusterx.example.com:8020/project. All namespaces that are not configured in the mount table, like /logs are linked to the filesystem hdfs://nn5-clusterx.example.com:8020/home. Alternatively we can have the mount table’s root merged with the root of another filesystem via linkMergeSlash. In the below mount table configuration, ClusterY’s root is merged with the root filesystem at hdfs://nn1-clustery.example.com:8020. It is an URI for accessing files via the WebHDFS file system. When one is within a cluster, it is recommended to use the pathname of type (1) above instead of a fully qualified URI like (2). Further, applications should not use the knowledge of the mount points and use a path like hdfs://namenodeContainingUserDirs:port/joe/foo/bar to refer to a file in a particular namenode. One should use /user/joe/foo/bar instead. HDFS and other distributed filesystems provide data resilience via some sort of redundancy such as block replication or more sophisticated distributed encoding. However, modern setups may be comprised of multiple Hadoop clusters, enterprise filers, hosted on and off premise. Nfly mount points make it possible for a single logical file to be synchronously replicated by multiple filesystems. It’s designed for a relatively small files up to a gigabyte. In general it’s a function of a single core/single network link performance since the logic resides in a single client JVM using ViewFs such as FsShell or a MapReduce task. Consider the following example to understand the basic configuration of Nfly. Suppose we want to keep the directory ads replicated on three filesystems represented by URIs: uri1, uri2 and uri3. Note 2 consecutive .. in the property name. They arise because of empty settings for advanced tweaking of the mount point which we will show in subsequent sections. The property value is a comma-separated list of URIs. All modifications performed under the global path viewfs://global/ads are propagated to all destination URIs if the underlying system is available. A read from the global path is processed by the first filesystem that does not result in an exception. The order in which filesystems are accessed depends on whether they are available at this moment or and whether a topological order exists. Mount points linkNfly can be further configured using parameters passed as a comma-separated list of key=value pairs. Following parameters are currently supported. minReplication=int determines the minimum number of destinations that have to process a write modification without exceptions, if below nfly write is failed. It is an configuration error to have minReplication higher than the number of target URIs. The default is 2.
readMostRecent=boolean if set to true causes Nfly client to check the path under all target URIs instead of just the first one based on the topology order. Among all available at the moment the one with the most recent modification time is processed. repairOnRead=boolean if set to true causes Nfly to copy most recent replica to stale targets such that subsequent reads can be done cheaply again from the closest replica. Nfly seeks to satisfy reads from the “closest” target URI. To this end, Nfly extends the notion of Rack Awareness to the authorities of target URIs. If a target URI does not have the authority part as in file:/ Nfly injects client’s local node name. The code above would result in the following execution. create an invisible file _nfly_tmp_f1 under each target URI i.e., hdfs://datacenter-east/ads/_nfly_tmp_f1, hdfs://datacenter-west/ads/_nfly_tmp_f1, etc. This is done by calling create on underlying filesystems and returns a FSDataOutputStream object out that wraps all four output streams. Thus each subsequent write on out can be forwarded to each wrapped stream. On out.close all streams are closed, and the files are renamed from _nfly_tmp_f1 to f1. All files receive the same modification time corresponding to the client system time as of beginning of this step. If at least minReplication destinations have gone through steps 1-3 without failures Nfly considers the transaction logically committed; Otherwise it tries to clean up the temporary files in a best-effort attempt. Note that because 4 is a best-effort step and the client JVM could crash and never resume its work, it’s a good idea to provision some sort of cron job to purge such _nfly_tmp files. Operations may move files from one namenode to another in order to deal with storage capacity issues. They will do this in a way to avoid applications from breaking. Let’s take some examples.